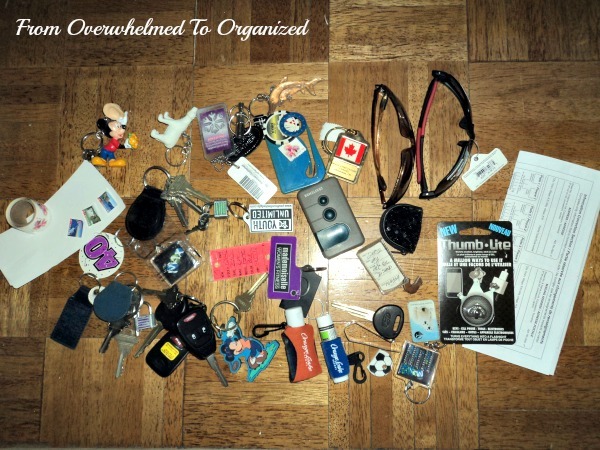 Is your entry way cluttered or organized? The place you enter your home can get pretty overwhelming sometimes. It gets a lot of traffic. Everyone in the family coming and going all the time... grabbing things on the way out the door... dumping things when they come back home. We need easy access to coats, shoes, keys, purses, wallets, and school bags. Not to mention hats, mitts, scarves, boots, and snow pants in the winter. Ugh! 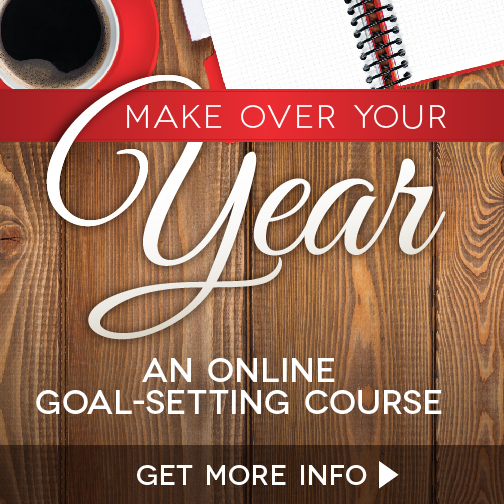 I'm overwhelmed just writing about it! Plus, the entry area is the first impression guests have of your home, unless you're lucky enough to have an entry off the side or back of your home for your family's use, separate from the front door where guests enter. But even if you don't have to worry as much about the appearance of your entry, you still need to be able to find what you need when you're leaving, without a lot of searching and chaos. 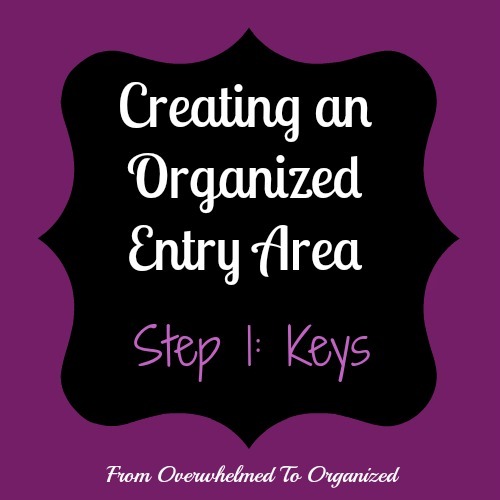 Over the next few weeks, I'll be sharing some tips to help you declutter and organize your entry area. I'll share some pictures of our entry and show you what works for us (and some tweaks I'm making), as well as share ideas you can use in your entry. And I'm kicking the series off today with keys! People often lose their keys. You've probably lost yours a time or two. Studies show we spend up to a year of our lives looking for lost possessions, with about 10 minutes per day of that looking for keys. A British study shows that the number 2 and number 3 most lost items are car keys and home keys respectively (mobile/smart phone was number 1). I can think of a lot of things I'd rather spend time doing than searching for keys! The key to always being able to find your keys is to designate a spot for your keys. If you don't have a "home" for your keys, figure out a spot now. Think about where you usually leave them and then create a place to put them. Hooks work great if you have some empty wall space near your entry. Or if you have a table or another surface nearby, place a pretty bowl or plate or tray on it for your keys. 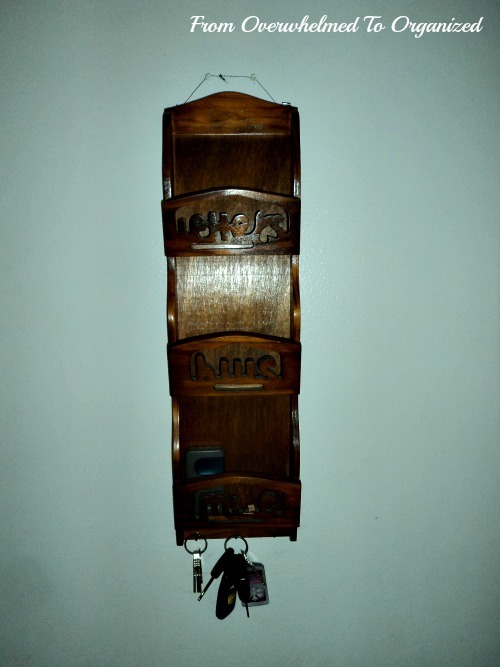 We use hooks at the bottom of our mail organizer that hangs in our front hallway. My hubby has a hook, I have a hook, and there's a hook for our extra keys. We hang our keys up every. single. time. We can count on them being there every time we need them. It's a very rare occurrence that either of us has to search for our keys. In order to make your designated key "home" really work, you need to keep it clutter-free. That way you'll be able to see when your regular keys are missing. And if they area looks nice you'll be more likely to consistently use it. If you have keys (or other key related items) in various places in your home, gather them all in one spot and sort through them. Make sure you know what each key opens (mark them if necessary - you can use nail polish to colour code them). If you have keys for locks you no longer have then dispose of them. I'm generally pretty good at decluttering, but I'll admit, our mail organizer/key holder needed some serious attention when I looked at it today. My hubby's keys are usually on the right hook but he was out when I took these pictures. I've had this mail organizer for many years and don't remember where I originally got it. 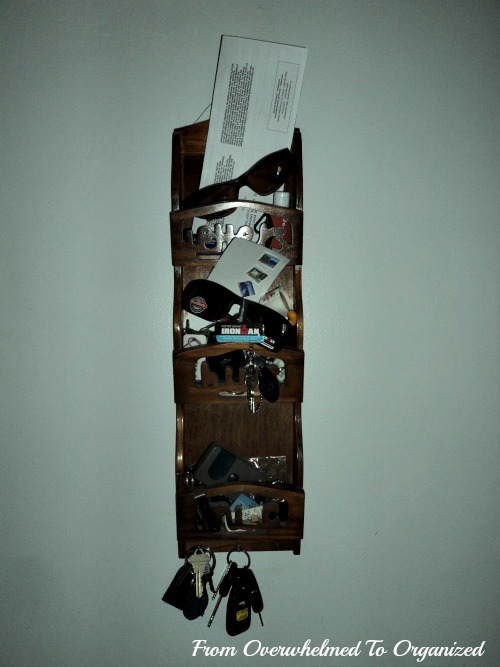 You can find a similar mail organizer with key hooks here though. We used to use the top and middle sections for incoming mail, stamps for outgoing mail, and a place to keep some paperwork that needed action (like our drivers' licence renewal forms or car ownership renewal forms). But since I created our command centre (2 years ago! ), we haven't really needed to use this mail organizer for mail or paperwork. But we still used it for our keys. Faithfully. Then that thing happened that happens when you stop using something the way you once did... it became a clutter magnet. Things just kind of migrated to this organizer. Mainly small things that we used near the door anyway. Like sunglasses and lipbalm and hand sanitizer. Those weren't too bad. But we also seemed to collect keychains here. For no real reason except that we had 1 or 2 extras at one point and then it just kind of became the place to put any new keychains that entered our home. It was more than time to declutter this baby! Check out ALL the things that were stuffed into it. I did a quick sort (it really only took about 15 minutes and most of that was figuring out which keys worked on which locks) and here's what I came up with. I set aside 15 keychains and other small items to donate. And I threw out some old keys for vehicles and locks we no longer have, several broken or very old keychains, a really old letter opener that we never use, 2 key tags for gym memberships that I haven't had in several years, and a few pieces of trash. Stamps to my junk drawer with the envelopes - not sure why they were in two different places anyway! Tiny locks to where we store our luggage since we only use them once every few years and only when we use our luggage - why were they in our entryway for all this time?! I gathered a few items to ask my hubby about (a keychain that was his, a tiny flashlight he may want to use, and a few keys to see if he knows what they belong to). This is the key to being able to find your keys! 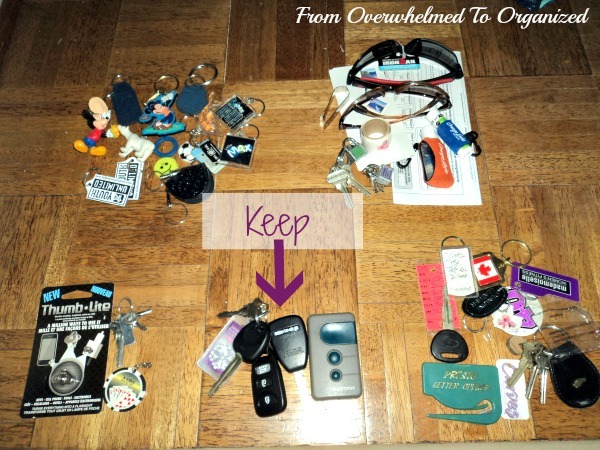 Once you've established a "home" for your keys, then ALWAYS put them in the SAME place. It's simple but for some reason a lot of people don't do this. If you just created a new "home" for your keys, make sure you develop a habit of using it. And get everyone in your family who has keys to use it as well. Otherwise you'll still be searching for keys when you're in a hurry to leave the house. Here's what the remaining things look like on our mail organizer / key rack. I can't believe everything else that was in here before didn't actually belong here! And that it's been there for YEARS. None of it was very big so it wasn't something that irritated me that much (unlike clutter in other parts of our house!). And honestly I really only use the key hook for the most part so I kind of forgot the rest of the stuff was there. Isn't it strange how things kind of become invisible after you've seen them so many times? 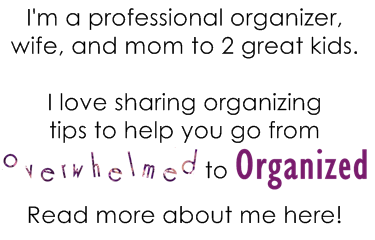 I'm glad to be rid of all the stuff that was in this mail organizer. And to celebrate, I'm going to look for a much smaller key holder of some sort. I still want something with hooks because that really works for us. And I need something with a shelf or basket to set the garage door opener in as well as one of my hubby's keys that has a broken ring hole so it won't stay on his keychain. But I don't need anything else really. It will just collect clutter! 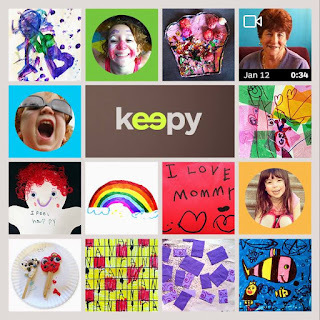 I'm looking forward to showing you some of the other elements of our entry that help keep our family's comings and goings as stress-free as possible! How often do you spend looking for your keys? 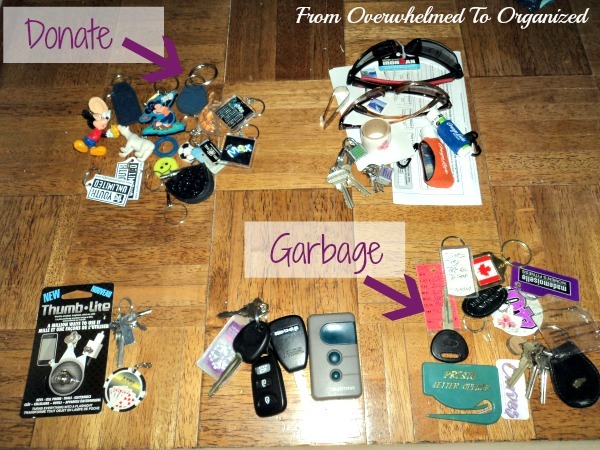 How do you organize your keys? Any entry tips you can share with us to help keep this important area of the home organized? 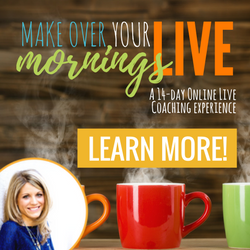 Have you ever had clutter become "invisible" and build up over time? Nice job, looks great! 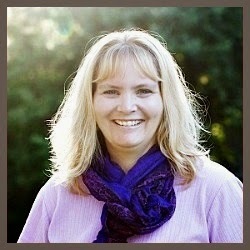 We are working on decluttering too, can't wait to see your next tip! 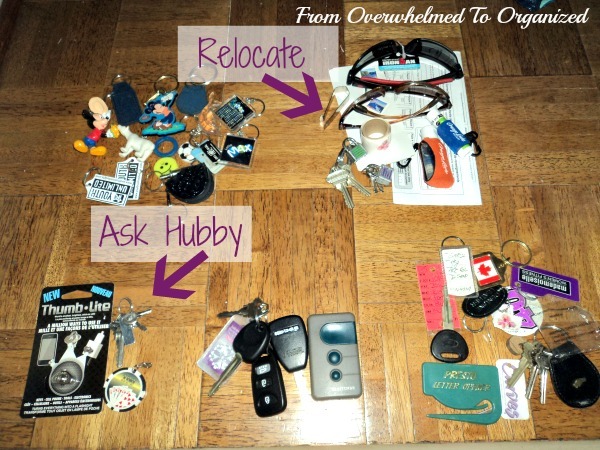 We did this a few years ago, my husband had keys for cars and motorcycles he no longer owned! Nice job! I am totally with you on the invisible thing! For next time, there are organizations that accept pop tabs and old keys and sell the scrap metal as a fundraiser. One I have worked with is Ronald McDonald House.